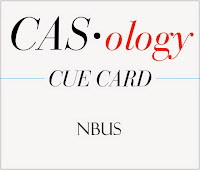 This week's CASology Cue Card is NBUS! Confused? NBUS is a term coined by the Queen of Words herself - Darnell, who just happens to be the CASology Guest of Honour this week! NBUS stands for Never-Been-Used-Schtuff and it refers to all the stamps, inks, papers, tools and supplies that you just HAD to have but then haven't gotten around to using. Most of us have some of it. And many of us have new goodies after the holidays - so now is the time to use your NBUS! You can link up at CASology and at Darnell's NBUS#3 Challenge, too. (the deadlines are different - CASology will close next Monday, January 19, NBUS closes on January 22). I used my new Papertrey Phrase Play Hooray die. I was inspired by this card by Michelle. 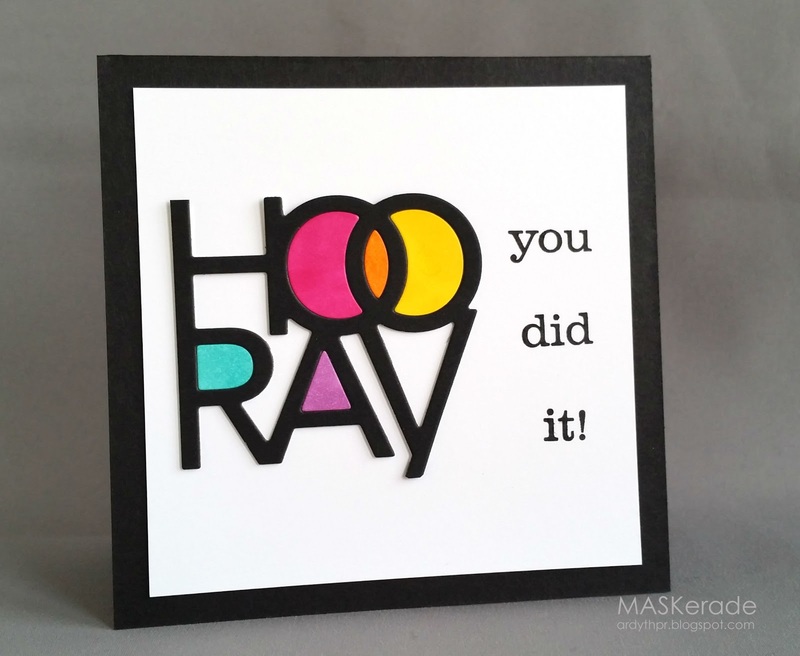 I love how she cut the 'hooray' out of the journal-card-sized die. I cut it once in black and then once in white. I coloured the white centres with Copics and placed them back into the black word, and then cut up the stamp that said 'you did it' so that I could change the arrangement from the one that you would expect based on the die's original layout. SUPER CAS AWESOMENESS. this "POW" factor, I love it!!!!!! I may have to CASE this, so awesome!!! HA! Perfect tribute to Darnell~ LOVE that fun Hooray! Brilliant design! And love that it's all about Darnell's wonderful NBUS idea! Very fun!! Love the tribute to sweet, Darnell! LOVE! Another fantastic use for this PTI die. A happy 'hooray' (and thanks!) to Darnell! I LOVE how u did this!! I can't believe this is the first time out of the box for this die, Ardyth... it is fantastic, and so is your card!! Fabulous. I too ordered that die. Just have to pick it up in MI sometime ;) Happy 2015! AHHH-Mazing. This is going all over my Pinterest Board so I can ogle it for ages to come! I love the bright, graphic impact of it! HOORAY - another great Ardyth card! This is fantastic. Love the black against the bright colors. Perfectly graphic CAS. This is utterly amazing. I just love everything about this card. Bold. Beautiful. Graphic. Pure Ardyth. :) Love this stunning design!!! Ahhh...love those in laid colors...gorgeous and oh so fun Ardyth. Fantastic card Ardith, love the inlaid colors! Super duper amazing! Yep, this puppy just punted the old #1 Fav Card out of the top spot! The colors make a statement - perfect for the sentiment!!! Love your style always Ardyth but this one just rocks and shouts ... LOOK at ME! Love it. Classy and eye-catching. I MUST get that die!! This is such an awesomely cool and graphic card! Love it! This is brilliant Ardyth! Love how you fit in the rainbow colours and the bold black letters...just stunning! Hey Ardyth!! I love totally love your hooray cut out. Its is so cute. I love how you added different colors in the empty space. Very clever idea! LOVE your card. The bold letters in black filled in with an array of vivid colors. This is a signature "Ardyth" card...bold and beautiful! Love the primary colors paired with bold black outlines! Fab Ardyth! I have this die but never thought just to use the word portion like this. Gonna CASE this!